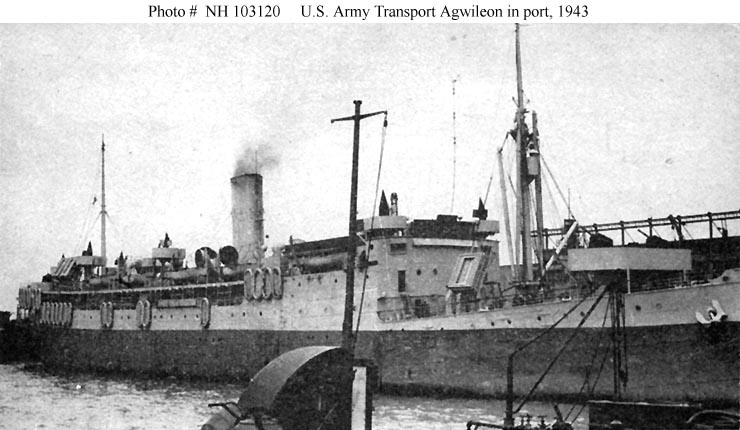 The U.S. Army Transport Agwileon (of 6678 gross tons) was originally the passenger steamer Havana, built at Philadelphia, Pa., in 1906. She subsequently served between 1917 and 1925 as the U.S. Navy hospital ship Comfort (AH-3). Reconstructed in 1927-1928, she then resumed commercial service as SS Havana. Following a grounding in 1935 the ship was renamed Yucatan, and after capsizing at her New York pier in 1941 she was renamed Agwileon and returned to service as a freighter. She was chartered by the Army in November 1942 and converted into a troopship. 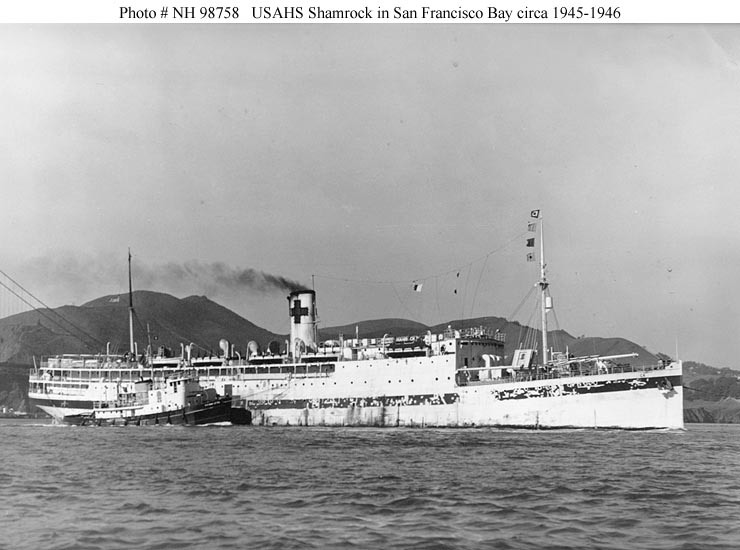 After one voyage to Oran and Gibraltar in April-June 1943 she was modified for hospital ship employment, being redesignated and renamed Shamrock in August 1943. Shamrock operated in the Mediterranean between September 1943 and February 1944, May and September 1944, and late 1944 and early 1945. Between April and September 1945 she underwent major repairs and ventilation alterations for service in the Southwest Pacific. No longer needed in the Pacific by the time she arrived at Los Angeles in October 1945, she was decommissioned the following month. After abortive consideration of a return to troopship duties, in February 1946 the ship was returned to the War Shipping Administration and placed in reserve at Suisun Bay, California. Shamrock was sold for scrapping in February 1948. 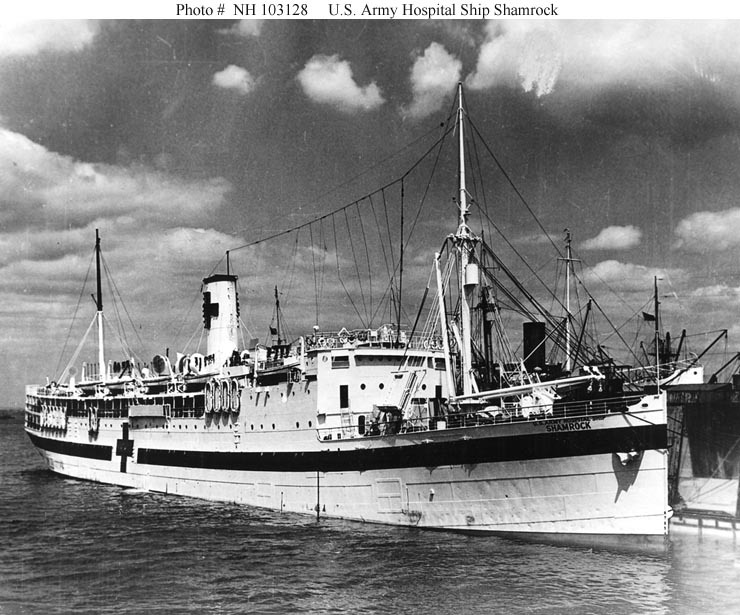 This page features all the views we have concerning the U.S. Army Transport Agwileon and the Army Hospital Ship Shamrock. USS Comfort (1918-1925, later AH-3). Halftone reproduction of a photograph taken circa April-June 1943, while the ship was in service as a U.S. Army Transport. 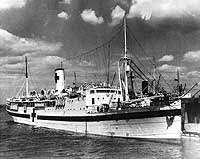 She became the Army Hospital Ship Shamrock in mid-1943. Built in 1906 as the passenger liner Havana, in 1918-1924 this ship was USS Comfort. 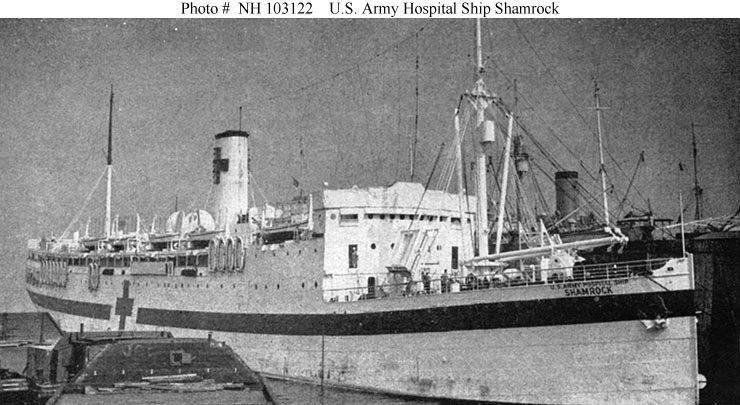 Halftone reproduction of a photograph taken circa 1943-1945, while the ship was in service as a U.S. Army Hospital Ship. She had previously been the Army Transport Agwileon. This ship was the Army Transport Agwileon in 1942-1943 and, in 1918-1925, served as USS Comfort. U.S. Maritime Commission Photograph, from the Collections of the Naval Historical Center. In San Francisco Bay, California, in late 1945 or early 1946. Donation of Boatswain's Mate First Class Robert G. Tippins, USN (Retired), 2003.